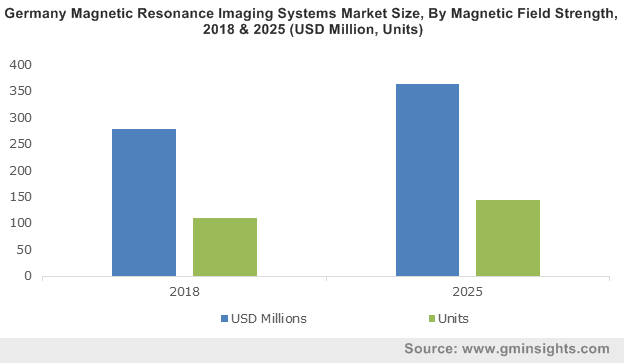 An intricate vertical of healthcare space, magnetic resonance imaging systems market has witnessed unprecedented advancements over the recent years. The extensive proliferation of the market is not only marked by the optimization and improvement of conventional MRI procedures, but also by the continuous emergence of new pulse sequences such as CEST-MRI (Chemical exchange saturation transfer MRI) and DWIBS. Companies engaged in the MRI systems industry have been willingly inclining toward R&D activities to come up with ground-breaking innovations in the product development, which by extension is opening up enormous new applications of MRI technology in biomedical research and clinical sciences. The progressive pathway traversed by MRI systems industry can be quite vividly depicted from the recent estimates, which claim the business space to have garnered USD 5 billion in 2016. Of late, it has been observed that the advancements in magnetic resonance imaging systems market is oriented toward the software side, enabling simplified cardiac imaging workflows, faster contrast scans, and even allowing MR scans for lungs. Toshiba’s contribution in this regard is worth mentioning. The Japanese conglomerate, in the year 2015, introduced a breakthrough technology, named UTE (Ultrashort Echo Time) sequence for dedicated lung MRI. As claimed by experts, Toshiba’s UTE sequence comes on the heels of the complications faced by conventional pulmonary MRI techniques, given the fact that lungs are filled with air and hence there is low density of hydrogen atoms required to create these clinical images. Such astonishing innovations in product design and techniques certainly manifest the growth curve of magnetic resonance imaging systems market. Another breakthrough product that has, of late, taken the MRI systems industry by storm is GE Healthcare’s MAGiC. The multi-contrast resonance technique is claimed to provide clinicians with an influx of data in a fraction of time when compared with conventional scanning technology. Allegedly, this unique technique gives clinicians the flexibility to use MR images retrospectively, resulting in fewer rescans, more decisive diagnosis, and significant time saving. Reportedly, the U.S. FDA has already provided a clearance to this innovative multi contrast state-of-the-art MRI technique. Speaking of the potential opportunities of MRI systems market, the business sphere is claimed to have extensive clinical and biomedical applications. Its exceptional beneficence has been best exploited and realized in central nervous system, particularly brain stem and posterior fossa. The fact that these imaging techniques are extremely sensitive to abnormal and normal patterns of myelination, MR images are highly recommended for diagnosing paediatric abnormalities. Increasing prevalence of these disorders along with growing popularity of minimally invasive diagnostic procedures is expected to provide a significant impetus to magnetic resonance imaging systems industry trends. Global Market Insights, Inc. forecasts overall MRI systems market to exceed a valuation of USD 8.5 billion by 2024. Regionally, U.S. witnesses a strong portfolio in the global magnetic resonance imaging systems industry. Being one of the most technologically affluent nations across the world, the country beholds technologically equipped medical infrastructure and upgraded healthcare facilities, the fundamental factor that is directly influencing the regional MRI systems market growth. Recently, the United States FDA has given clearance to a seven tesla (7T) MRI device for clinical use in the United States. Reportedly, the renowned agency has reviewed the safety of the radiofrequency subsystem through rigorous experimental validations, computational modelling, and simulations. Furthermore, it has been also reported that a clinical study conducted in order to compare the images from 3T and 7T devices simultaneously, depicted that images from 7T were of better quality and resolution. For the record, the Magnetom Terra is the first of its kind to get a FDA clearance to be officially used for clinical purposes in the country. Such technological advancements in MRI scanners and its extensive penetration in clinics and biomedical research centres is expected to bring lucrative business opportunities for the overall magnetic resonance imaging systems market. However, dearth of proper technical knowhow required for handling these machines might prove to be deterring for the industry expansion. Radiographers and clinicians are required to perform diagnostic tests and select appropriate imaging parameters for proper adjustment of the system. Another crucial environmental issue that MRI systems market players are presently dealing with is the declining trend of helium gas deposits. Nonetheless, with prominent industry players focussing on bringing technology that requires comparatively lesser amount of helium for functioning, the situation is expected to improve in near future, which can be aptly justified by the CAGR estimation of the global MRI systems industry which has a target of 7% over 2017-2024.